Even though I’ve never owned a webOS-based device, over time I’ve followed with interest the various Mobile OS options out there – and webOS certainly seems to have some great ideas. In many ways, webOS is significantly more functional than Apple’s iOS – but is the HP TouchPad good enough as a consumer product to carry through this advantage? I’m lucky enough to have been allowed to borrow a new TouchPad (model HSTNH-129C), and these are my thoughts after an afternoon’s usage. Physically, the HP TouchPad is very pleasant to hold due to its rounded design – very reminiscent of my iPad in its clear Belkin protective case. It weighs more than an iPad2, but less than an iPad2 with SmartCover attached – and significantly less than my iPad plus case. The TouchPad is deceptively chunky, though – and the rounded design has caused several people to ask whether it has a protective case itself. The rear of the case it an absolute magnet for fingerprints, and seems susceptible to scratching (this new unit already has one score along the back) – so a protective case may be wanted for everyday use, further increasing the unit’s bulk. It’s not clear whether the front-panel features an oleophobic coating (as Apple devices do), but it appears to be mildly more fingerprint-resistant than the back. The top of the TouchPad has a headphone socket and an annoyingly scratchy recessed metallic power button with surprisingly abrupt (if not sharp) edges. The right-hand side features a long volume rocker at the top which is the only other metallic design element as well as a placeholder press-in/press-out asset tag at the bottom – which will presumably be the location of the SIM slot on 3G models (when they are released). The bottom edge has a somewhat lost-looking mini-USB socket for charging, and the right-hand edge features stereo speakers which match the side and position of the tag slot and volume rocker on the opposing side. The edges of the speaker and headphone voids aren’t rounded, and so can also feel almost sharp when handling the unit. The front face has a front-facing camera at the top and the Home button at the bottom. This lozenge-shaped button has a pleasant action, possibly due to it’s smaller size than the Apple equivalent – but it has no logo to indicate that it is anything other than a change in texture of the main body, and so its existence isn’t immediately obvious. There is a thin white light-bar line along the centre of the button, but this is only lit when an application card is being displayed in full-screen. To allow for haptic feedback, the TouchPad does have a (rarely-used, unfortunately) vibrate function – which is a small but distinct advantage over the Apple alternatives. There is no provision for expanding internal storage with SD media. Overall, the HP TouchPad hardware feels solid and well-built, but at the same time is clearly of cheaper construction than the iPad whose aluminium unibody construction is leagues ahead of the plastic body of it’s HP counterpart. In a future version I would hope that HP would round-off some of the corners to make the device more pleasant to carry. Having said this, the TouchPad is a pleasant device to hold for extended periods, and is not so heavy that this quickly becomes tiring. The battery level dropped by 55% in a half-day’s light usage with Wifi enabled and Bluetooth off. The back of the TouchPad get noticeably warm, even when sitting unused but powered-on. Powering the TouchPad on (or off) requires the power button to be held for five seconds, during which it is not obvious whether unit has a dead battery, or simply has not yet initialised the screen. When the HP logo appears, it is another minute and five seconds before the logo fades out and the (by default) blue-tinted webOS home-screen appears with a somewhat melancholic sigh – HP would do well to install a more upbeat set of sounds and a different default wallpaper to improve first impressions! Having said this, once webOS cards are present, sliding a card out towards the top of the screen causes it to disappear with a gentle “whoosh”. Dragging a card towards the bottom of the screen, on the other hand, causes a creaking sound to play when the card drops below a certain point, and then a loud “wheee!” as the card bounces back and flies off the top. Given that the ‘Sounds & Ringtones’ preference pane allows only the Ringtone to be set (the utility of which on a 3G-less tablet is surely questionable? ), this must be an HP default – which is completely out-of-character given the serious professional tone of the rest of the device. Once booted, the display fires-up instantly on a press of the Power button (something which even the iPad isn’t always great at), and the lock-screen displays recent alerts in iOS-style lozenges in addition to a padlock icon which can be freely moved around and needs only be dragged in a general upward direction to unlock the device – which is more flexible than iOS. However, until the lock-icon is tapped there is no clue given to the user to what they are expected to know – only by tapping or holding the lock icon is the text “Drag up to unlock” briefly displayed. Unfortunately, the notification boxes don’t appear to be tappable in order to jump to the source of a given alert. 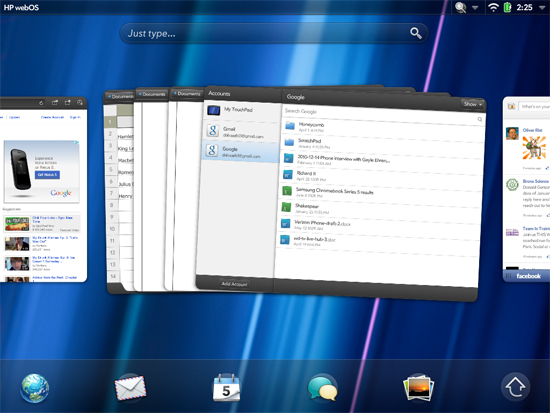 The home screen of webOS features an Apple-style menubar at the top of the screen containing the current application title on the left and the option of an application-specific main menu indicated by a triangular drop-down icon. The top-right always shows the OS icons (rotation-lock, Wifi strength, battery level, time, etc.) and a fixed OS system menu containing the full date, numeric battery level, brightness level, Wifi and VPN and Bluetooth statuses and details as well as options to enable or disable Aeroplane mode, Rotation lock, and Mute. This is much more accessible that the iOS equivalent functions, which are hidden several levels deep below the Settings application. Taps on the menu icon(s) have to be fairly accurate – the application-specific menu in landscape mode, especially, can be somewhat tricky to tap accurately for right-handed users who have to reach across the display to reach the active menubar area. 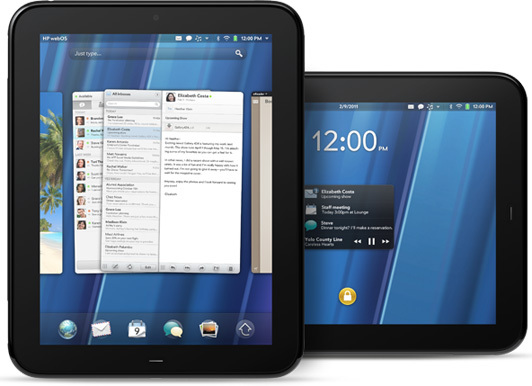 This layout makes webOS more reminiscent of a desktop OS, but isn’t necessarily well adapted to tablet usage. The system menu is more convenient, however, and the application menu is optional and will generally hold infrequently-used options (such as access to application preferences). Below the menu-bar at the top of the screen is a “Just type…” gadget which offers Spotlight-like device searching, returning results from “Bookmarks & History”, the option to search in Google, the option to search using Maps, Wikipedia, Twitter, or the HP App Catalog (the middle two opening the relevant website with the search pre-populated), or the option to create a new email message, IM, event, memo, or Facebook status update with the entered text. When entering a search, the default behaviour on pressing Enter is to open the browser to perform a search in Google – as opposed to the arguably more intuitive iOS behaviour of confirming the search and closing the keyboard. Indeed, webOS seems to want to keep the keyboard on-screen as much as possible, rarely removing it automatically, leading to the user having to work harder to manage their workspace. At the bottom of the home screen is a customisable quick-launch bar containing common application shortcuts (Browser, Mail, Calendar, Instant Messaging, and Photos by default) followed by an arrow icon which brings up the Launcher. Launcher divides installed cards into Apps (HP/system apps), Downloads (apps from the store), Favourites (into which other apps can be dragged for quick access), and Settings (a Microsoft Windows-style selection of settings applets). Here again the UI is inconsistent – the Favourites pane implores you to “Tap and hold any app to drag it to this page.” However, dragging an app from the shortcut bar at the bottom of the screen into this display simply removes the app form the bar (without prompting of visual indication that this will occur) and does not make the app a favourite. Kudos to HP for having properly localised “Favourite” for UK English. The webOS interface – and the work which HP clearly has still to put-in in order to improve it – shows again how good the iOS User Interface really is. 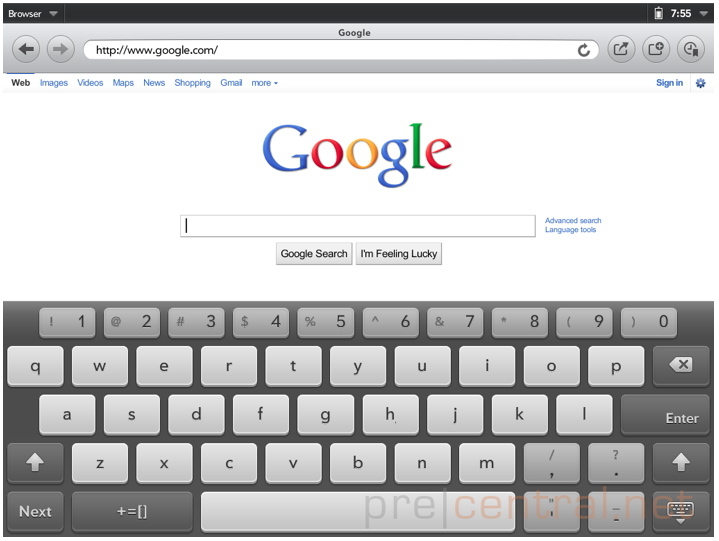 There is a limited use of animation, but not in entirely consistent ways: For example, closing the keyboard with the Web Browser app causes the keyboard itself to smoothly slide off-screen, but the large globe logo in the centre of the screen jumps down the the new screen centre as soon as the keyboard begins to move. It’s a small cosmetic issue, but one which tells of a lack of overall polish. Keyboard input can be difficult, as there doesn’t appear to be a way to hold-down your finger and drag over an input area in order to move the cursor position – you have to tap on the location where the cursor should move to, and this can be very tricky with narrow letters. A long-tap on the keyboard’s top-level domain button does give a selection of alternatives beyond “.com”, and international accents are handled in a similar way. I like that keys with additional options display an ellipsis to indicate this, but it’s a shame that this only happens when a(n other) key with additional options is already held down. The keyboard makes a mildly annoying software click (which can be disabled), but this is only audible at the three highest volume levels – which makes most other sounds too loud… ensure that if you can hear the key-clicks, you don’t accidentally drag anything off the bottom of the screen 😉 It’s notable that the alternate input page of the keyboard has a selection of smilies, which seems a little incongruous with the general professional focus of the device as a whole. Whilst the TouchPad is a multi-touch tablet, this capability seems to be infrequently used – the only apparent way to switch between different browser tabs, represented as different webOS cards, is to press the Home button to return to the Home Screen and then tap on the desired card in the browser’s stack… I miss being able to perform a two- or three- finger swipe to easily move between tabs or apps. Likewise, an upwards swipe to show all applications feels natural, and I find myself performing this action to no avail. All taps show a sonar-like “ping” radiating form the point of contact – which is a good compromise, as the webOS interface is often slow to respond. Rather than leaving the user wondering if their tap registered, this feedback at least lets the user infer that some operation is in progress. Built-in apps such as the browser are quick to launch, third-party apps feel sluggish when starting – the Adobe Reader app can take 15 seconds from launch to usability, for example, although this time does seem to depend on how recently it was launched and what has been run since – there appears to be some caching in place which can reduce the start time to only 5 seconds or so, albeit not consistently. The Browser allows scrolling in all directions, with iOS style spring-loaded borders if the edge of the page is exposed. This feels unnatural – even iOS only spring-loads the top and bottom of pages, leaving the left and right edges fixed. One of the changes in OS X Lion was to introduce spring-loaded side-edges – although in this case it supports swiping forwards and backwards through browser history, and feels more positive than the webOS Browser’s implementation. Likely the only real difference is the degree of deceleration applied by webOS, which causes the animation to finish slowly enough to feel a little weak. Opening a new tab appears to launch a whole new instance of the browser, so feels a little slow compared to the instant response which could be anticipated. Tapping on the History and Bookmarks icon in the browser (where History is represented by an overlaid “clock” icon, which doesn’t seem intuitive) brings up a side-bar with a control gadget across the bottom edge. Tapping this or attempting to drag it to the left causes the bar to quickly slide out of view, whilst dragging the bar to the right also closes it. In the Photos app, there is another instance of this same gadget – in this case, dragging the control to the right causes it to spring back in to its original place, but tapping or dragging left causes the picture view to take up the whole screen. A single-tap moves the bar between its two positions whilst a doube-tap is treated as two single-taps, and can cause the bar to start moving and then reverse direction so quickly that both taps appear to have been ignored. These inconsistencies tend to make the generally rather attractive webOS User Interface seem unforgiving and non-obvious. Looking at visual flourishes, webOS again loses out to the high expectations set by iOS when moving side-bars around, as expanding the side-bar to full screen clearly scrolls the bar to the left whilst retaining its original width, and then instantly resizes the bar to the full-screen size after the sliding animation has completed. When in the Photos app and many pictures are visible, there is a brief although noticeable flash as the photo area is cleared to black, the photos are re-rendered for their new layout, and then finally the updated display is shown. This occurs within a fraction of a second and there is again caching in place such that future re-sizing (without quitting the application) is faster, it is still a somewhat jarring user-experience. Talking of jarring experiences, if a page in the browser is zoomed in past the maximum level of zoom, then on release the view jumps back to maximum zoom so quickly that it appears to be an almost instant jump. The iOS approach of smoothly and more slowly zooming out is much more pleasant. On/Off toggles which are so nicely animated on iOS switch instantly between states in webOS, and it is noticeable that scrolling through long lists feels a little sticky, with the UI lagging slightly behind user input, and the scrolling never being quite smooth. I really like webOS approach to pluggable services, an approach which iOS could really learn from: when starting the Mail or IM services, in addition to the default account types that webOS knows about there is also the option to download additional types via the App Catalog. You therefore have a single OS-provided source for all data-sources of this type: No more starting a Facebook app, then jumping out and starting a Twitter app, then jumping out and starting another app as iOS demands – in webOS the unified app provides a convenient single source for all providers in one place. HP should capitalise on this as a significant advantage over Apple’s more constrained eco-system beneath which such openness would be difficult to add. Third-party applications seem to do a good job (so far) of sticking to webOS design guides, and so maintain the consistent look which seems to escape Android apps, but which iOS tends to excel at. I really like the HP App Catalog, which is a significant improvement over the iTunes-derived interface of iOS. In addition to allowing apps to be searched for and selected by category, the default view is of a professionally laid-out digital magazine with high-quality photography which features a combination of opinion-pieces and articles in addition to double-pages which discuss a specific app. Whilst this doesn’t actually present much more information than is available in iTunes, the feel is much more user-friendly and conducive to confidently making a purchase. I particularly liked the “Month at a Glance” section which lists applications related to specific events happening throughout the month – although its a shame that this has not yet been updated for August. App prices seems to be on a par with the low prices which the dominance of the iOS App Store have led the public to expect – the average price of features apps looks to be around the £2.50 mark, with the lowest bracket costing £0.79. The App Catalog is probably one of the strongest and most impressive aspects of the TouchPad, demonstrating how HP do understand that the public want an integrated and simple to use yet beautiful interface to their tablet applications. If the care which has been lavished in this key area of tablet acceptance can be rolled-out to the rest of webOS also, then HP could have a slow-burning success on its hands. In conclusion the TouchPad is an impressive first-effort in the tablet arena for HP, and were it not for the existence of Apple’s devices would certainly have been hailed as revolutionary. However, in this iOS-dominated world, even the latest 3.0.2 update of webOS feels unpolished, if not slightly unfinished: In many ways it is beautiful, but look just below the surface and inconsistencies and rough edges abound. All of this is fixable, though – HP could resolve these issues with a single software update and I’m confident that, given time, they will. The hardware itself cannot be fixed so easily, of course. It is lucky, then, that the TouchPad is physically at all bad – but its plastic exterior tends towards the bulbous, especially when compared to the sleek aluminium lines of the iPad2. I would anticipate that a future version of the TouchPad will adopt a metallic exterior – perhaps an anodised black chassis to match HP’s corporate stylings. A thinner, metal TouchPad with a faster process and/or a more optimised webOS release could well give the iPad a run for its money due to greater app integration with the OS and greater flexibility – but the question has to be quite where the iPad will have evolved to once the TouchPad has improved to where it is now. The TouchPad with webOS needs an upgrade to address general sluggishness in places and to improve interactivity in terms of how UI visual elements respond to users’ expectations. 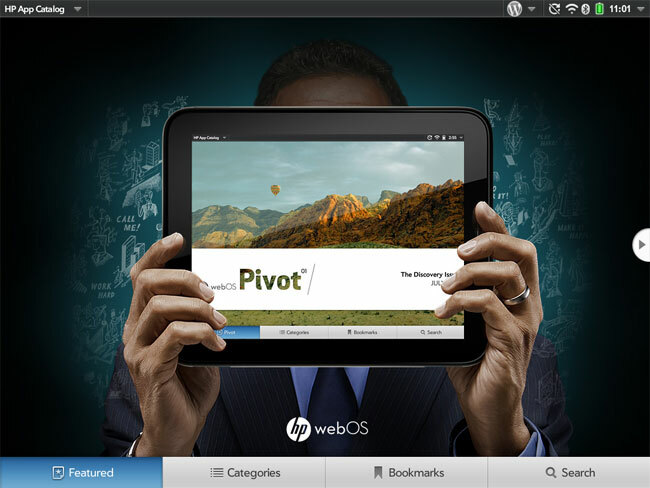 webOS already feels more pleasant to use than Android-based tablets, however. The iPad has to be the first choice of tablet right now, but for anyone wishing to avoid Apple’s ecosystem or in the market for a second tablet, the TouchPad is a sound choice and is fascinating in terms of the areas (primarily in terms of the App Catalog and the support for pluggable information providers) where it already improves on the now-mature iOS platform. 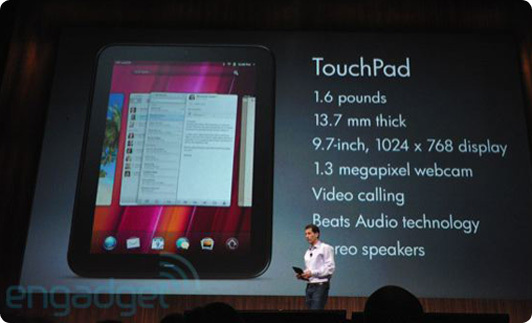 I look forward to the next release of the TouchPad with great enthusiasm.